Need a durable bow. Because it’s man-made, the materials used can better withstand changes in temperature and humidity. Hunting will then be trouble-free any time of the day. Want a stable hunting weapon. Stabilizers attached to compound bows allow you to shoot the arrow with less movement on the shaft. Demand for a let-off point. Having a let-off point on your compound bow means you can shoot longer, and with greater accuracy than with a traditional bow. These bows are exciting to use. They’ve been existing for over five decades. With several models to choose from, the selection process may be confusing. But don’t worry. This comprehensive guide will help you find the perfect model for you, by presenting reviews of the top options available on the market. Shooting arrows at 340 fps, this is one of the fastest ones out there. This is because of their PSE past-parallel limb technology that allows for a forceful release of arrows. The single cam action also adds to the power since it is the fastest you’ll ever encounter. Because it’s made of aircraft grade aluminum, it has increased strength and decreased weight, making it one of the lightest bows on the market today. For amplified performance, it even has a larger string track with new bow geometries. It also comes with a Planar Flex riser and the Mossy Oak Break-Up Infinity styling. It comes with an Aries Sight, Whisker Biscuit Rest, Flextech Stabilizer, Mongoose Quiver, PSE Neoprene Sling, Peep Sight, and Nock Loop. The maximum limb bolt turns from the bottom is 10 turns. It’s very accurate and its drawing is smooth. The draw weight is 60 pounds, making it manageable for every hunter—rookie or veteran. The size, power, and speed of the PSE Prophecy make it perfect for shooters who are on the hunt for small, medium, and large game. Some users find the draw cycle to be a bit defiant. You have to get used to its 75% let-off instead of the usual 80%. Bottom Line: Aside from its speed, this compound bow is also quiet and functions without vibration. Whether you’re a beginner or a professional, or a beginner, you’ll definitely enjoy the perks of this fast beast. 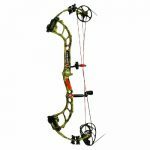 With a limited budget, the task of finding a high-quality compound bow gets harder, but we have done the extensive research for you, and below we have listed reviews of the top models within different price ranges. 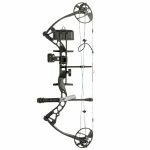 This bow from the Southland Archery Supply (SAS) features a 35″ axle to axle, 30″ draw length, 270 fps, making it one of the best budget options. Its compressed ABS limb spans balance, weight and strength to continue the life of the bow. For enhanced accuracy, the limbs of this bow are accommodated in place by the back pivoting limb pockets. It highlights a durable aluminum, fiberglass and plastic construction that can withstand being used repeatedly by beginning archers and shooters, including misfires that might break the strings on other bows. It also features an outstanding autumn camouflage color to help you blend in with nature as you hunt, regardless of whether you’re a novice or a professional. This gear definitely is of high quality and offers durability at an extremely affordable price. It includes a damper that will muffle noise and vibration, and stabilize the string to ensure a smooth and more accurate shot. The limb pockets serve as a strong connection with rigid tolerances for an accurate shot. It’s designed for easy aiming and drawing. It’s capable of producing enough power to take down small and medium prey. It has an adjustable draw weight (when you loosen the bolt, the draw weight will decrease by 5lbs. and when you tighten them, they will increase the weight by 5 lbs.). It’s a very great compound bow for beginners. Because of its hefty 4.4 lbs. weight, it’s difficult to use for a long period of time. Bottom Line: If you’re looking for an accurate and powerful bow that is perfect for the beginner, the SAS Rage 70 is the one you need. It comes at a great price and is easy to use. This bestseller has taken shooting and hunting to the next level. It offers incredible adjustability to match your development, making it worthy to be dubbed as the “best compound bow under $500”. 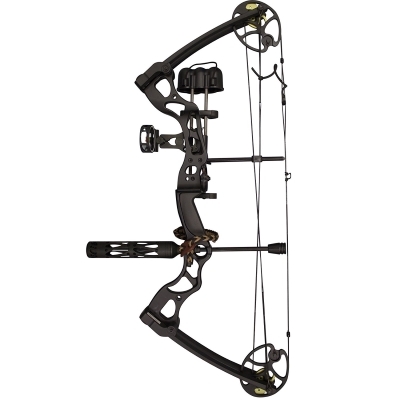 With combined Diamond performance and versatility, this bow features draw length adjustment from 13”-31”, and draw weight adjustment from 5-70lbs. It even comes with a redesigned cam system that launches arrows at up to 310 fps. Measuring 31.5”, one axle to the other, it delivers an effective let-off of 80% so you can easily hold full draw when you need to. It comes with a whisker biscuit and a quiver. Weighing only 3.2 lbs., it’s perfect even for children. It has a smooth release. It’s proven to be accurate and powerful. 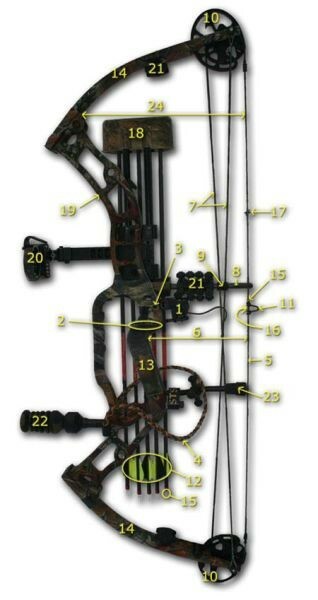 It comes with 3-pin sight, arrow rest, quiver, peep, and string loop. Snapping arrows into the quiver is hard. The foam also falls out on its own. The included arrow rest seems to be of low quality. Bottom Line: This easy-to-maintain hunting and target bow is one of the best options for the money. By the time you get your hands on it, you’ll be surprised by its incredible performance and aesthetic appearance. PSE and Drury Outdoors have teamed up to bring us this user-friendly compound bow that is absolutely a top tier bow if you’re on an unlimited budget. Thanks to its Hybrid Cam, this bow adjusts like a single cam, but gives you the high performance you want from a hybrid cam bow. 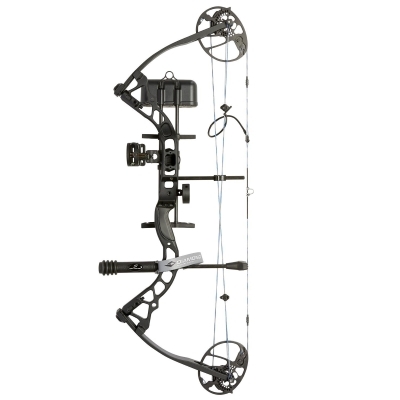 The PSE Madness 32 is a compound bow of medium-length; 32-3/8” axle-to-axle bow built from a forged riser. It’s fast and comfortable to shoot with, launching arrows at a blistering 340 fps on a smooth draw with an amazing 80% let-off. It also features their signature pre-stressed split limbs that perform very well. It includes a Strider Sight, Whisker Biscuit Rest, Spire Stabilizer, Raven Quiver, PSE Neoprene Sling, Red Aluminum Peep Sight and Nock Loop. It has a great draw cycle and a decent back wall. It’s ready to shoot out of the box. It’s a great hunting bow for shooting medium, large, and very large game. Its draw length is adjustable. Bottom Line: With all its features and functions, this 4.1 lb. bow clearly is one of the best models you can get on the market today. This compound bow is primarily designed for women. Worry no more about the fixed draw lengths and weights, because you can adjust them according to your own shooting ability. This also highlights an advanced grip design for enhanced accuracy. Plus, the hand torque has been eliminated in this bow, thus enhancing accurate targeting. It’s also great for women’s hands since the grip is very comfortable. Because of its maximum preload quad limbs, your accuracy is superb. The draw length spans from 12” to 30”. The draw weight can be adjusted from 5lbs. to 70lbs. It’s sturdy and durable because it’s made from aluminum material. It’s lightweight, weighing only 3.6lbs. It has a very smooth draw cycle perfect for women of any age. It’s loaded with relevant accessories, allowing you to save money. It includes offset spring suppressors, a quiver, peep sight, Whisker Biscuit arrow-rest, Trophy Ridge sight, MV-Cam system, and a wrist strap. If you’re a novice, you need this one set up for you, but professional archers will need only a few minutes to set this one up properly without assistance. Bottom Line: It’s light and quiet, and obviously very flexible. For its low price, you’ll get everything you need from performance to accessories. Without a doubt, this two-pound Original bow from Genesis is the best kids option. In fact, it’s the official bow of the National Archery in the Schools Program, and any bow tagged by the national archery is definitely worth every penny. It’s perfect for youngsters because they can just adjust the draw length from 15” to 30” and the draw weight from 10lbs. to 20lbs. The draw weight of this bow is so light that the draw cycle becomes easy for young users. Plus, it’s ultra lightweight, which makes it easy for kids to carry it around with ease. It’s a good entry point into the archery hobby. It does not shoot fast, which is safe for first timers and inexperienced youth archers. It’s built with single-cam technology so there are no tuning issues, less recoil, less noise and more accurate shooting. The kit includes a belt tube quiver, adjustable arm guard, 3/16″ hex wrench, an Owner’s Manual, and five (5) aluminum arrows. 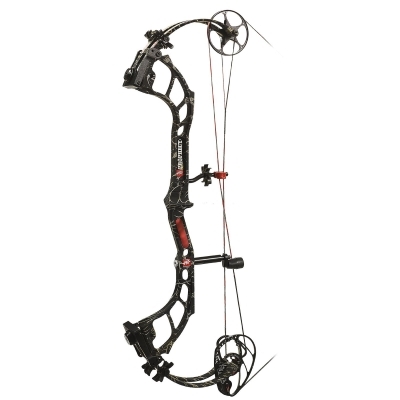 It’s created from 6061-T6 Aluminum which will help you gain optimal balance with the bow. The riser component has been tapped and drilled for accessories. The bow also has molded competition grip, NAP flipper style arrow rest, and capable slide. It’s not appropriate for hunting. It’s a little more expensive compared to other small compound bows. It’s not suitable for archers with more experience. Bottom Line: The Genesis Original is suitable for both young and old, savvy and novice archers. It’s a great addition to your sports collection. These bows were first developed by Holles Wilbur Allen in 1966 and are generally considered to provide superior accuracy, velocity, and distance compared to other types of bows. They come in a variety of shapes, sizes, colors, models, and have different cam set ups, axle to axle measurements, and a lot more. They use a levering system involving cables and pulleys or cams to bend the limbs or ends of the bow. It’s easier to and more convenient to use since the mechanical advantage it provides allows the archer to exert less physical effort when the bow is at full draw. They also attract hunters stalking game since they are easier to use and may come in camouflage design as well. There are things to consider before getting one. Since you will need a reliable and accurate bow for your shooting, you must invest on a compound bow that will suit your strength and style. Also, you shouldn’t focus on the speed alone. Some people tend to aim for the fastest bow without considering its effects and requirements. If you have no idea what to consider in buying one, then read on. I will tell you what to look for, but first you need to have the basic knowledge of its parts. A compound bow is a modern bow that uses a levering system, usually of cables and cams, to bend the limbs before a shot is taken. Arrow Rest – The arrow rest is the unit that screwed into the riser via the berger hole and provides a catch for the arrow to rest on before and during the shot. Models are either stationary while some mechanically “drop away” during the shot. 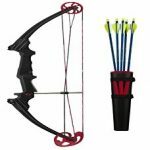 Arrow Shelf – The arrow shelf on a compound bow is the horizontal shelf designed into the riser which contains the arrow in all stages of the shot. It also protects the gripping hand from accidental injury. Berger Hole – The Berger Hole is the tapped hole above the arrow shelf on a compound bow. The arrow rest is screwed into the berger hole from the outside of the riser. It is standard to have your arrow centered on the center of the berger hole when setting up the bow. Bow Sling – A wrist sling is installed in tandem with a stabilizer. It provides a “catch” for an archer so they do not drop the compound bow after taking a shot. Bow slings should be installed loosely so they do not add unneeded torque when the shot is fired. Bow String – The Bow string is the string, which terminates at the cams on a two cam system. On a “solo cam” system, the bow string’s ends both terminate at the bottom cam but travels around the top idler wheel. 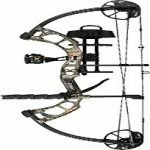 Brace Height – Brace height is the measurement from the crotch of the grip to the bow string. The average brace height is around 7 inches. Cable(s) – The cables run from cam to cam and work with the cams during the execution of the shot. Cable Guard – The cable guard is the fiberglass rod which runs perpendicular from the riser towards the bowstring and works with cable slide to keep the cable(s) out of the arrow’s line of fire. Cable slide – The Cable slide is a plastic piece which attaches to the cable guard and holds the string / cables out of the arrow’s line of fire. Cams – Cams are round to oval metal discs which are held in place to the limbs via a pin and they are where the string and cable(s) terminate. They are attached to the end of the limbs and transfer the power of the limbs to the string and arrow during the shot. Bow’s will either have one or two Cams. On a Solo Cam bow, the cam will be attached to the bottom limb of the bow while an idler wheel will be attached to the top limb. D-Loop – This is a point of connection for a mechanical archery release; it is made or a short piece of cord fastened to the bow string by two knots. Draw Weight – draw weight is the amount of force, measured in pounds, needed to bring the bow to full draw. Fletchings / Vanes – These are the feathers or plastic vanes which are glued to the end of an arrow. They steer and correct the arrow during flight. They can be oversized to dramatically reduce speed (for bird shooting) or undersized for increased speed. Grip – The grip is the part of the riser that you hold when shooting. Most manufacturers install a removable grip which can be replaced with an aftermarket grip to suit an individual’s comfort. Limbs – Limbs are the flexible fiberglass planks that are attached to the riser on one end and support the cam or idler wheel on the other. They work with the shooter to store and release the kinetic energy need to deliver a shot. Nock – It is the insert on the rear end of the arrow which attaches to the bow string. Nocking Point – The nocking point is the location, on the bow string, that the arrow attaches to before a shot. Peep Sight – This is the donut shaped device inserted between the strands of the bowstring which gives the archer’s eye its first point of alignment. When the archer lines up his sight while he is viewing through the peep sight consistency is more obtainable. Quiver – The quiver is the permanently mounted or detachable unit which contains the archer’s arrows. Riser – The riser is the central component of the bow which is normally constructed out of machined aluminum. Sight – An archery sight attaches to the riser and contains pins, cross hairs or a laser dot which the archer can adjust to make a more accurate shot. You can check our compound bow sight guide here. Silencing Aids – These are various accessories which can be purchased and installed on a bow/bowstring to absorb vibration to quiet a shot. These attach to either the bowstring, cables, limbs, or the riser. 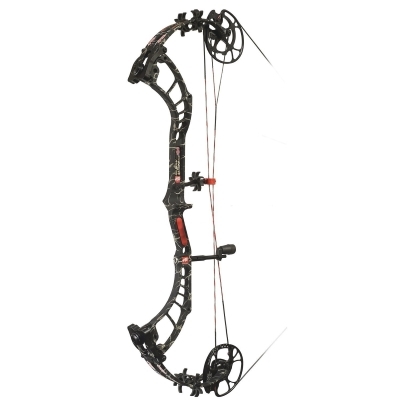 Stabilizer – It stabilizes the bow at full draw giving the bow a different center of balance. String vibration arrester – This silencer, which is attached to the riser and or the ends of the limbs, has contact or near contact with the string prior to the shot and absorbs vibration during the shot which is directly transferred from the string. Tiller Measurement – This is the measurement from the point where the limb meets the riser and to the string in a perpendicular line. Determine what you’ll use the bow for. If it’s for hunting, you’ll want a fast one. Speed, which is expressed in Feet Per Second (FPS), determine how fast your arrows travel from the bow. When you are choosing a compound bow, you should aim for a bow with the highest speed. The faster the speed of an arrow when you shoot, the harder it is for your prey to react against it. Likewise, the faster the speed, the harder the arrow till hit the target. However, if you’re young or you’re a beginner, it’s safe to stick with ones that do not shoot fast. This is also referred to as “ocular dominance,” which basically means that your brain prefers visual input from one eye over the other. Your dominant eye is usually the same side as your writing hand. Place your hands at arm’s length, and press your thumbs and forefingers together to form a triangular opening. Keeping both eyes open, look through the triangle and center it on something, like a doorknob. Now close one eye, then the other. If you can’t close one of your eyes by blinking, have someone cover it for you. Your dominant eye will keep the doorknob centered in the triangle. The draw length is the distance between positions of the bowstring at rest and at full draw. 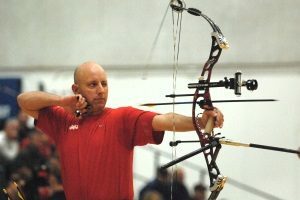 Having the correct draw length in accordance to your own physical stature is paramount since you can never achieve your full shooting potential without having a properly fitted bow. Most bows have adjustable draw lengths. Stand tall, making sure you’re not hunching forward and that you’re not wearing any clothes that could restrict arm movement or prevent you from seeing whether your elbows are locked. Spread your arms to the sides, making sure that together they form a straight line that is parallel to the floor. Have someone measure your arm span carefully, from the tip of one middle finger to the tip of the other one. Make sure the measuring tape is fully stretched out or else the measurement won’t be accurate. Take the length in inches and divide it by 2.5. The draw weight is the amount of weight you feel while retracting your bowstring. To increase speed and the amount of energy from the stroke, it is best to shoot from a compound bow that has a high maximum draw weight. If you decide to hunt deer, a draw weight of 45lbs is the bare minimum needed, so most hunters opt for compound bows with a draw weight of 50-70 lbs. Let off is calculated as the percentage of peak weight that you hold at full draw. If your compound bow has a 70 lb. draw weight, and there is a 75% let off, it means your full draw is around 17 lbs. A lower let off increases the velocity of your arrow, whereas a higher let off lets you hold the bow longer at full draw. Too much let off can lead to a bad shooting form but can be useful in certain hunting situations when you have to wait for a perfect shot. This is the distance from the bowstring to the grip of the shooter. Shorter brace heights result in more stored energy, thus resulting in increased arrow velocity, but they are not recommended for novices since minor flaws in shooting technique are amplified in exchange for a shorter brace height. Start with the standard 7-inch brace height if you’re a beginner. Buying a compound bow is a big deal. Before you buy, make sure you’ve read reviews about the different types of compound bows available and their prices. Also, it’s safe to keep it simple. Focus on finding a bow that will match your activities and suit your body’s proportions and strength. The accessories and upgrades can be considered later when you become more experienced. An expensive one might have all the functions and technology a bow could ever have, but if you can’t use most of the features, then it will just be a waste of money. Obviously, there’s a lot of options to choose from but with proper knowledge and guidance, choosing becomes easier. Over the years, they’ve improved and are now of high quality. That is why there are also several price ranges and products to choose from. Hopefully, though, I have made it easier for you to decide. Just remember the tips I’ve presented and you’re good to go! Recurve Bows vs. Compound Bows: Which To Choose?